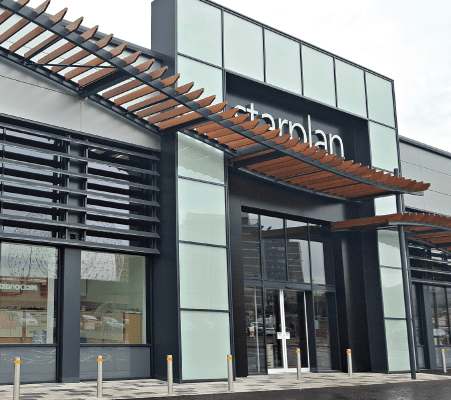 Starplan Fitted Kitchens Belfast is a family run company. We have been operating for over 40 years, working tirelessly as a brand name you can trust. Our Belfast Fitted Kitchen showroom has recently been renovated and we can’t wait for you to see it! Why not pop in and see us at our Boucher Road store. We’re really excited to show off our fabulous fitted kitchen range. 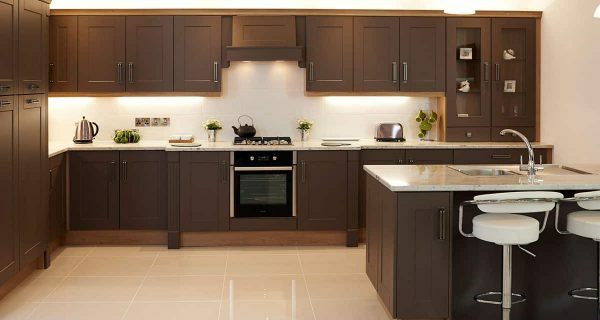 We operate with our very own professional kitchen fitting teams right here in Belfast, Northern Ireland. This is because we endeavour to make sure all of our customers and kitchen installations receive the same great and personal service. Our new 13,000 sq ft fitted kitchens store is complete with all the essentials you need to design your ideal space. 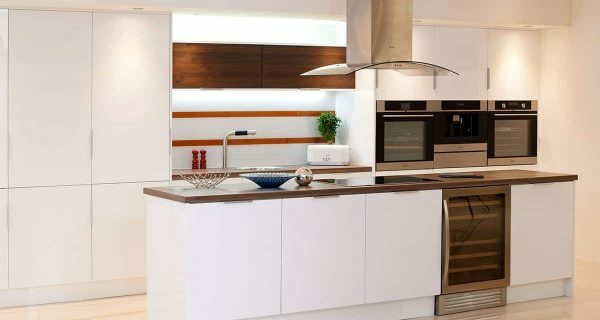 From modern glass streamline kitchen units accompanied by state of the art kitchen appliances to traditional country style kitchens with homely range cookers, you’re sure to find something to suit your personality. If you need some kitchen home inspiration, why not take a look at our colour visualiser? You can mix and match a huge range of finishes and colours, to see what your dream fitted kitchens Belfast could look like! We manufacture most of our fitted kitchen products in-house, at our factory showroom in Dungannon. This allows us to cut out the middleman! It also means we can create bespoke fitted cabinets, units, doors etc, to make sure we utilise every bit of kitchen space. 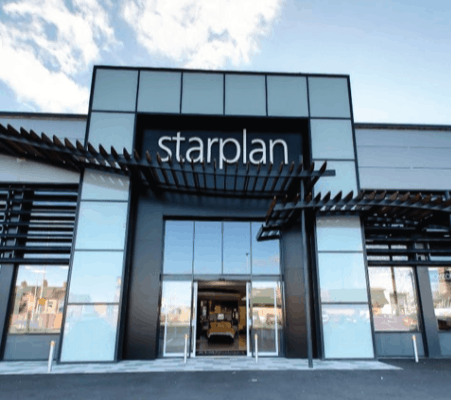 So if you’ve been thinking about a brand new fitted kitchen, why look anywhere else than Starplan’s kitchens Belfast showroom? Our showroom at Boucher Road, Belfast hosts a kitchen fitting team that serves Belfast City and beyond. Address: 3-5 Glenmachan Street, Boucher Road, Belfast (New Superstore Beside McDonalds), BT12 6JA. White and high gloss fitted kitchens Belfast always deliver on style. Our bespoke version takes modern kitchen design to the next level with handcrafted curved doors and carefully detailed finishing. View our extensive range at our fitted kitchens Belfast showroom. With soft sweeping curves and a classic Buckingham door, these porcelain fitted kitchens Belfast makes a strong style statement. Subtle detail, modern kitchen design features and classic finishes combine to create a room full of class. View our collection at our fitted kitchens Belfast showroom. A strong, solid and classic look with modern kitchen design. 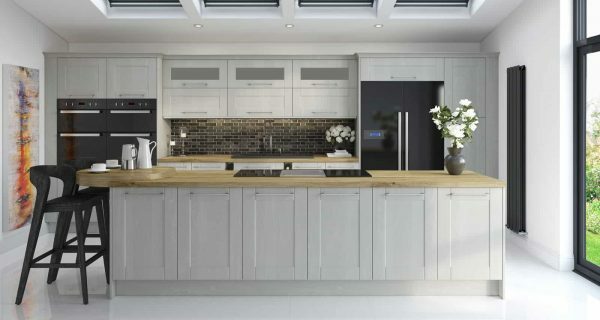 The combination of stone grey matt finish doors with cool Odessa oak accents create ideal fitted kitchens Belfast. Attention to detail is paramount and is reflected in each of our choices at our fitted kitchens Belfast showroom. 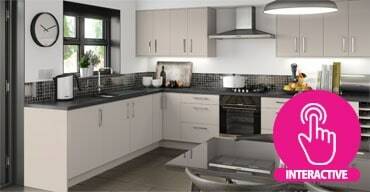 Already a modern kitchen design classic, the Alabaster gloss fitted kitchens Belfast combine practicality with minimal chic. 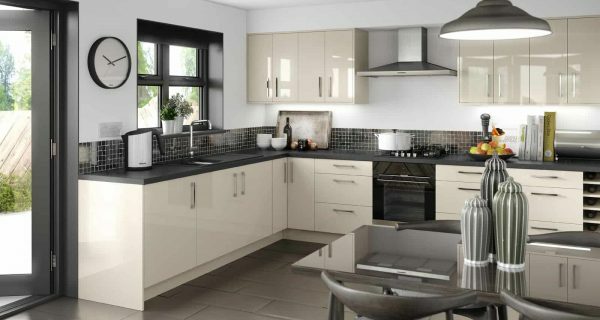 The Avalon worktop and breakfast bar in granite black adds a sharp mono-chromatic contrast. 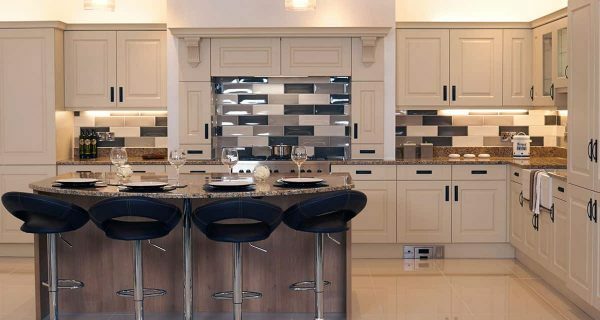 Browse our collection of this sophisticated style at our fitted kitchens Belfast showroom. 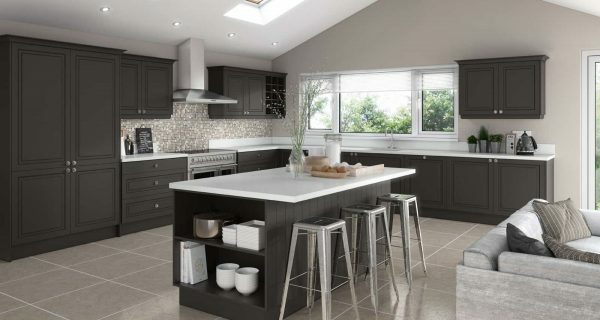 The modern graphite grey of these fitted kitchens Belfast is softened with a velvety matt finish. The slim worktop creates the perfect, cool contrast with metallic-gloss accents that catch the light with this kitchen design. View this beautiful and practical range at our fitted kitchens Belfast showroom. The soft oyster-grey tones of this cashmere grain have a soft light-reflecting tone that adds warmth and depth to fitted kitchens Belfast. A combination of clever modern kitchen design and relaxed detail such as solid woodwork, creates a calm atmosphere at our fitted kitchens Belfast showroom. The amazing Gladstone Oak finish and linear style of this kitchen design which is reminiscent of Italian Design. 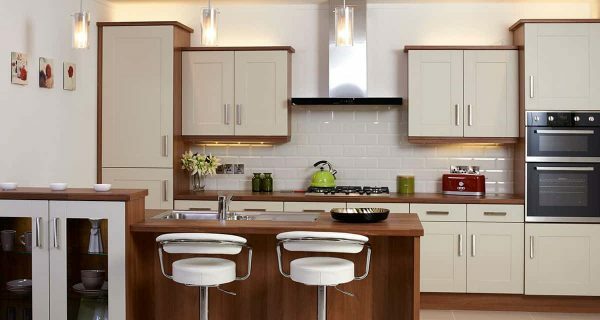 These fitted kitchens Belfast are sharp, stylish and luxurious. An elegant kitchen that can deliver sophistication. View our extensive collection at our fitted kitchens Belfast showroom. 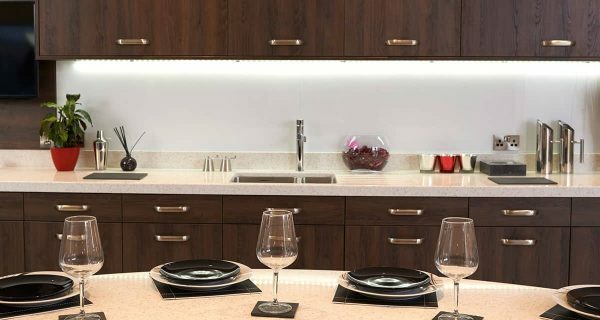 The combination of cool porcelain door finish with rich walnut trim in these relaxed and modern fitted kitchens Belfast is a tasteful treat for the style-conscious. There are lots of clever touches too such as the breakfast bar with storage cupboard. View all of our exciting collections at our fitted kitchens Belfast showroom. The rich truffle shade of this contemporary kitchen design contrasts with crisp, clean white worktops to make a strong style statement with our fitted kitchens Belfast. Detail is key and you can see our collections of simple sophistication at our fitted kitchens Belfast showroom. 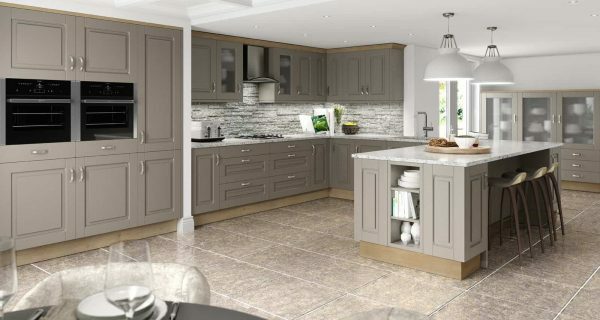 Cool, classy and relaxed, these porcelain fitted kitchens Belfast are the epitome of relaxed New England style. This is a soft country look which will appeal to everyone, including those living in the city. Our expansive collection of these elegant kitchen designs are available to view at our fitted kitchens Belfast showroom. The soft, glossy cashmere doors and dark accents of these fitted kitchens Belfast will make the perfect start to any day. They are proof that a modern, minimal look can also be warm and yellow. If this sounds like the kind of look and feel you want for your room, then you can view our collection at our fitted kitchens Belfast showroom. 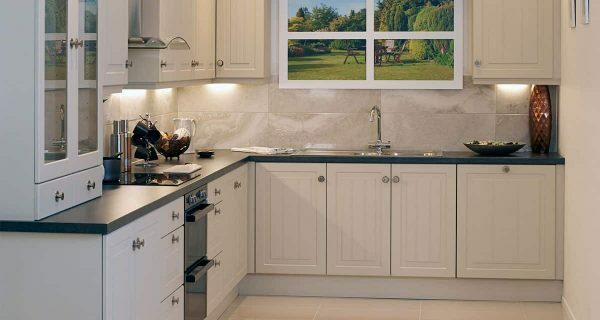 With a beautifully subtle porcelain finish, these fitted kitchens Belfast effortlessly combine timeless shaker-style with the best of modern living. 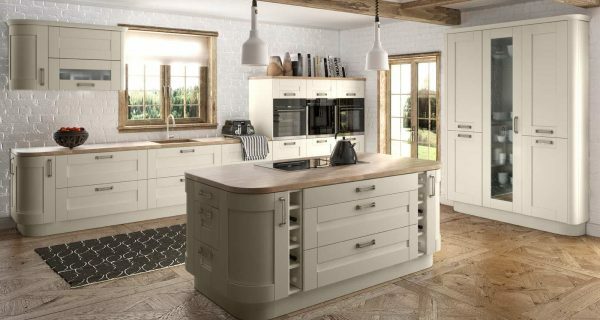 A classic charm with an up to the minute style, this kitchen design carries an air of sophistication and class. View our collection at your leisure at our fitted kitchens Belfast showroom. 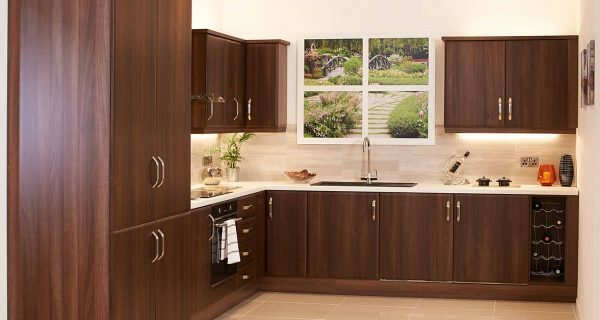 In a deep chocolate and tobacco wood finish, these fitted kitchens Belfast are dark, dramatic and stylish. A classic look combined with contemporary lines, this kitchen design fits in perfectly with either a modern or classic setting. Browse our extensive range at our fitted kitchens Belfast showroom. 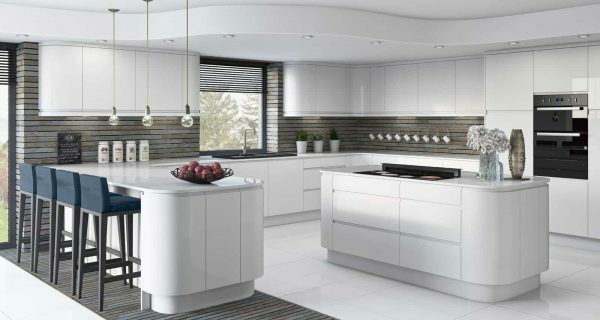 The ultimate in contemporary Scandinavian style, the glossy white fitted kitchens Belfast combine elegant minimal lines with maximum storage. This is design sophistication at its brightest and whitest with lots of attention to detail. Sound like what you’ve been looking for? Visit our fitted kitchens Belfast showroom. Everything as planned. Very pleased with wardrobes. High quality product with excellent fitting by two friendly and helpful members of the Starplan team. Our new bed was delivered today 7/6/17 as quoted. The delivery team were very polite and respectful of our property. They installed the bed for us in a very professional manner and ensured we were happy with the service they had provided. On the day of fitting, the fitters completed the fit out in a couple of hours. Really happy with the quality of the wardrobes and the work of the fitters on the day of installation. Excellent service from start to finish, excellent price. if I could put pictures to show you I would. Excellent company to deal with from the sales staff right through to delivery I could not fault them. Communication was top class. Texts/emails and phone calls updating order progress. Would highly recommend and will definitely do business with Starplan again. Excellent service from the start with room planner Kim. Excellent/clean fitting service highly recommended to family and friends. Soon to be planning our second room hope to get the same planner and fitters. Excellent!! Having shopped around for a fitted wardrobe we stumbled upon Starplan! So glad we did!! Went in for a browse and came out with an appointment for someone to come and measure! Sales person from Wednesbury branch Nicky was very very professional and so helpful and patient. Both myself Jo and Mike from Tamworth had a great experience with her knowledge and experience.